Regarding the i3 vs other electric cars (leaf, ioniq, e-golf), I think the i3 is targeting a different market. For starters, the i3 is by far the smallest externally, and has the smallest turning circle (9.9m), has the most distinctive styling, and is rear wheel drive. BMW intended this car to be their "Mega city" car. And I imagine their target market will keep it alongside another larger BMW in their garage. This shows in design decisions they have made, such as the small gas tank. This is not a great car to drive Auckland to Wellington, and BMW didn't intend it to be so. From that point of view, a massive range isn't also important. Yes, it does seem as though BMW designed the i3 as a very smart futuristic "around town" vehicle, rather than as a comfortable vehicle for travelling long distances. Some owners have reported that, at higher speeds, the rather small wheels give a slightly bumpy ride which isn't all that comfortable over long distances, but they're fine for city driving. Incidentally, the replacement tyres for the i3 are rather expensive at around $450 each. According to NHTSA testing, there’s an issue with frontal crash protection for drivers of the “5th percentile female” in the driver’s seat, if they don’t wear their seatbelt. Basically, that means that, in the event of a frontal crash, females of about 5-feet tall and 110 pounds have a “marginally higher risk” of sustaining neck injuries than is allowed. Again, if they aren’t wearing their seatbelt. That latter bit is important because it’s illegal to not wear a seatbelt in 49 of the 50 States. This article also says that BMW has issued a recall and stop-sale order on all of its i3 electric vehicles in the U.S. after failing a recent National Highway Traffic Safety Administration crash test. The simple remedy is to wear your seat belt, but it will be interesting to see whether other countries (including New Zealand) will also consider a similar recall. It seems that it might be quite difficult and time-consuming for BMW to come up with an acceptable fix for this problem. I have yet to see any mass market EV that looked "nice". Considering BMW's strategy going forward will be electric 80% I doubt what you have said is likely true. According to to ecotricity youtube channel, in 18 state in USA it isn't mandatory to wear a seatbelt !! So in order to sell cars, unrestrained passengers need to be protected in the event of a crash. I hope this isn't copied without thinking by NZ. It would be ridiculous for a car here to be recalled because it doesn't protect someone from injuring themselves while breaking the law.. BUT the 18 that are mentioned above do not have "primary" enforcement, i.e a cop cannot stop you solely because of a seat belt violation, - you can be fined for not wearing a seatbelt, but only if you are being stopped for something else..
"The car company BMW has been censured by the UK’s advertising watchdog for claiming an electric car equipped with a small petrol engine was “clean” and “zero emissions”, in a ruling that could have a knock-on effect on other electric car advertising." In the Facebook ad the car was described as “a clean car and helps to give back to the environment”. A complainant suggested that the presence of a petrol engine meant this statement was incorrect. BMW argued that the nature of the petrol engine, in maintaining charge for the electric engine rather than taking over from it when needed, meant its description – which came from a user – was accurate. Of course, BMW does sell an "all electric" version of the i3, so it's only the range extender version that is affected by the decision of the UK Advertising Standards Authority (ASA). ... even the cleanest electric vehicle can only have as little impact on the environment as the electricity grid from which it is powered. So, as long as coal or gas-fired power stations are used to generate electricity used to charge-up EVs, then it's also unfair to say that such EVs are clean and have zero emissions. Now when are NZ power stations going to quit using coal or gas? The above article in “EV Talk” on 14 December 2017 gives details of the pricing of the new 2018 BMW i3 “facelift” models. The “pure electric” i3 will cost $76,900, and with the petrol range extender the price will be $84,500. The newly introduced “pure electric” BMW i3S will cost $84,500, and with the petrol range extender the price will be $91,900. This article gives further details of the new 2018 i3 models. It's a bit disappointing that BMW hasn't produced a higher capacity battery in its 2018 facelift models than the 33kWh 94Ah battery that is currently in the 2017 model, which gives a "pure electric" range of about 183km (more around town). This is my first time posting on this forum, so hi to you all and thanks for all the handy information you have posted on EVs. BMW have just upgraded the battery, perhaps they did not think they needed to increase the range again after having just done so with the 2017 model.The 94 amh seems like a good choice/ size. Picked up my new I3 pure electric from Auckland BMW and drove to Hamilton earlier this month .BMW Hamilton were very helpful as were BMW Auckland.Dropped the car off there and they topped up the Battery.Then on to Tauranga. Really enjoyed the trip. It handles the open road very well for a small car. Did not feel at any stage that the car was not up to the job and would be more than happy to drive the i3 cross country again. I am a little bit confused with the fast charging system, as I know practically nothing about the network and the type of system it uses. I am confident It will become clear in the not to distant future. Was wondering if anyone can tell me what type of plug this model has? There is nothing in the owners manual to indicate what type it uses. I really would like to try fast charging it . @Dinga96, post a photo of the charging connectors you have on the car, and we can explain what each one is for, and where it can be used. In the meantime, jump on to https://www.plugshare.com/ and you can look it individual charger location and see what plug types they have there (do they match one on your car). Running man.Looked at the various types and mine looks like the CCS/SAE type although when I tried to hook up to one at the charging station it did not match. I have a photo of it.Not the best pic , the ipad camera does not work well in poor light conditions. Looks like SAE J1772 DC CCS Combo 1 Connector Type 1 (i.e. CCS type 1) to me, not CCS type 2. 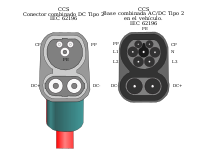 Basically, the round side of that plug will take a type 1 connector for a slow charge (depending on the available power supply, in the order of 10 hours from flat), or if you plug in a CCS type 1, which uses both the round and oblong parts of the plug at the same time, that gives you a fast charge (half an hour ish). So you need to look for either CCS type 1 (fast) or type 1 (slow). From that, their suggestion is that CCS type 1 should be phased out in favour of CCS type 2, so it's a little odd that a brand new NZ car has CCS type 1 fitted (CCS type 2 would be more obvious). Yes I can see they are different.Its the wrong type for that vehicle according to BMW own media release. Yep, definitely worth a query to the dealer. Yes looks like I am one of the lucky few!I read in the link they are supposed to be contacting new owners to have this sorted .I will give them a shout on Monday lol.